Supergirl returns for a fourth season with a revival of the anti-alien sentiment plot and slight shifts for most of the major characters. Last season was a bit lacking especially in its latter half with a poorly conceived villain story that ended up being more confusing and satisfying. This episode suggests that there’s an awareness of these errors on the part of the writers and a conscious attempt to let the show play to its strengths. One of those strengths is its lead. Kara appears more focused and confident in both of her personas. Part of this has to do with having to fill a void in Superman’s absence and expand the scope of her heroics to a more global setting. The montage of her flying around the world protecting people in unfamiliar locations and even finding the opportunity to retrieve a little girl’s balloon is a great reintroduction to Supergirl that fits with her established character. Having her use her heat vision on a falling object before catching the escaping balloon perfectly encapsulates that she handles both large and small scale problems with grace and optimism. The montage ends with her making a presidential press conference with seconds to spare and confidently making herself know with a question. James points out that she’s great at multitasking which is horrifically on the nose considering visual language made that abundantly clear but it does help set up Kara’s narrative for the episode. She feels that she has everything in her life under control and can handle whatever the world throws at her. It’s clear that she’s managed to find a balance between her career at CatCo and her life as Supergirl but as the episode progresses she learns that not everything is as ideal as it initially seems. This is expected because if Kara has everything figured out in the first episode of the season then there’s nothing for her to learn for the rest of it so it must surely follow that her current mindset is misguided in some way. Kara’s main problem is that her current approach has given her a form of tunnel vision. She is so focussed on everything directly in front of her that she misses the detail behind the world that she’s trying to save. This is best exemplified by how ignorant she is to the severity of the growing anti-alien sentiment because she believes only what she has experienced. As far as she’s concerned aliens have gained greater acceptance across the world and she has personally never felt more loved than she has flying across the globe protecting people. It is pointed out to her that she presents as Human and tries to live up to idealised Human values in order to set an example. Other aliens aren’t able to do the same because they can’t physically pass as Human and Kara seems to have forgotten about the Human impulse to fear that what is different. Once she realises this she has to come to terms with the fact that she’s dealing with a very different problem to anything she has faced before. Villains are one thing because they can be fought but there’s nothing tangible about this that punching can fix. This prejudice is systemically woven throughout the world. Kara points out that the people involved and the people she saves are one in the same so it’s a problem she has no idea how to deal with. Learning what people are really capable of has shaken her world view in a really profound way and she goes from being confident in her approach to her double life to completely clueless as to how to proceed. It’s an abrupt yet effective realisation that comes across as something Kara has somewhat known all along but has been blinded to up until now. It has been all around her every step of the way but she has almost refused to see it. It’s almost unfortunate that Agent Liberty (Sam Witwer) exists at all because having a ringleader for this issue removes a lot of the nuance from it and gives Kara someone that can be fought. The counter argument to this is that Agent Liberty is only taking advantage of thoughts that people already have and isn’t the cause of them. In some ways this makes him more dangerous as defeating him won’t actually solve the problem. For now he doesn’t seem to be all that interesting beyond Sam Witwer’s intimidating vocal performance but there’s plenty of time to expand this threat even if the underlying public opinion as an antagonist is the more interesting story. Mercy (Rhona Mitra) and Otis (Robert Baker) are more interesting so far as they are much more overt in their methods. Their hatred for aliens is very much on the surface which says a lot about the state of the world if they are comfortable wearing their prejudice on their proverbial sleeves and committing horrible acts without much fear of judgement. It also helps that they are resourceful and able to take Kara on without much problem. The prejudice angle is further explored through J’Onn who has stepped down from the DEO to immerse himself in the world around him in an effort to truly become a part of it. He is the one to warn Kara that anti-alien sentiment is on the rise and clearly makes every effort to help aliens on Earth remain hopeful. His perspective allows him to see both sides of the argument and have a better handle on the truth of the situation than Kara does. He points out that the increasing tension is a backlash to the legal tolerance because people feel that their privilege and sense of entitlement is threatened by society opening up to aliens becoming a part of it. This all feels disturbingly relevant and I suspect that the conversation between Kara and J’Onn about whether it’s better to focus on how bad things have become or remain optimistic that things and people will get better will be familiar to many viewers. Fiona (Tiya Sircar) becomes almost the focal point for those issues. Like J’Onn she faced prejudice because of her skin colour as well as being an alien so she has a unique understanding of different forms of prejudice. Her empathic nature also helps her sense how others react to the lack of acceptance. It’s clear she will become part of the larger story so hopefully the writers will continue to use her for greater insight into the situation assuming she isn’t dead of course. 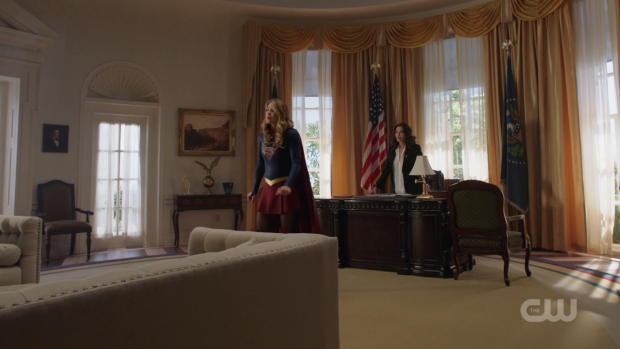 Surprisingly CatCo becomes an important part of the show once again as focus is given to Kara’s double life. Her career as a reporter is shown to be going very well to the point that she naturally assumes the role of a mentor to newcomer Nia Nal (Nicole Maines) who acts very like Kara did at an earlier point of the show. Once again this show isn’t subtle and has Kara directly point this out to her but outside of that their interactions are both natural and entertaining. Nicole Maines quickly establishes herself as an engaging presence who brings her character to life well and Melissa Benoist does well in the screen time they share while dropping a little Calista Flockhart into her performance as James quickly points out. James is the only character who lacks a defined purpose so far but it is only the first episode and there is still the lingering issue of his life as Guardian to be dealt with. Being under scrutiny for his vigilante career is more of a Lena story than a James story as it involves her going behind his back in order to solve the problem for him while he hopes for a favourable decision. Lena’s approach is crafty yet well intentioned as she wants for James to stay out of prison so she requires some form of leverage that can be used to make James’ potential convictions go away so decides to take the opportunity to reconnect with her mother to see what useful information can come out of a discussion with her. Lena and Lillian’s conversations are intermittently interesting in this show. Brenda Strong is an excellent screen presence who is often underserved by underwhelming writing but when there’s a strong focus on the mother/daughter relationship there is often great material for her and Katie McGrath to work with. This episode is one of the better examples of their relationship to the point that Lillian feels like a more nuanced character than she actually is. 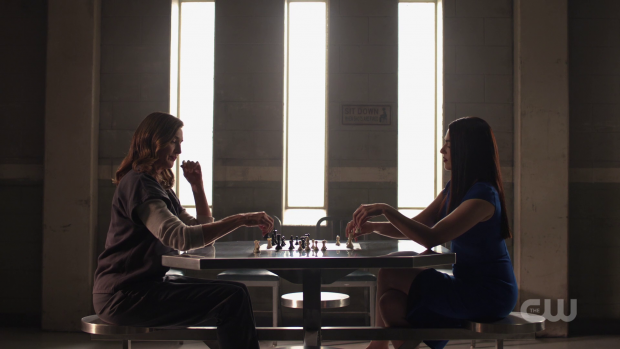 The rapid chess game that they play is a really nice touch that reminds the audience of the level of intellect on display and the way both of them are clearly reluctant to say anything definitive in case the other gets the upper hand makes for a wonderfully tense scene. The fact that Lena basically wins the conversation by using the information her mother gives to secure James’ freedom is satisfying enough and Brenda Strong plays the reaction to perfection. Her facial expression suggests that she is reluctantly impressed that her daughter was able to catch her out though toppling the king on the chess board suggests that taking down Bruno Mannheim is part of some long form plan on her part. If the writers can find different ways to play with the Luthor dynamic such as this then it’s definitely something I’d like to see more of. Alex is settling into her role as director of the DEO well. It’s a natural fit for her as far as roles go though there are some teething problems in the form of Brainy and what she expects of him. So far the Alex/Brainy dynamic is fun to watch but isn’t fully formed as yet. This proves to be deliberate as Alex ends up unconsciously punishing him for not being Winn. Brainy eventually picks up on this and they both agree to forge their own connection bereft of those expectations. So far Brainy largely takes on the Winn role without much being added and it’s disappointing that he doesn’t make use of his true form. There will hopefully be plenty of opportunity for Brainy to come into his own as the season progresses. A strong and confident opening to the season that focuses on the show’s strengths while ignoring what dragged it down last season. Showing Kara having everything under control early on before revealing that she has been operating under a misguided assumption works really well and the threat coming from the people she defends is a really nice touch as it makes for a more complex setup than we’ve had previously. The presence of Agent Liberty feels almost unnecessary and the character fails to be as interesting as those he works with. One saving grace might be that Agent Liberty is simply capitalising on a problem rather than causing it. James’ potential conviction for his exploits as Guardian ends up being more of a Lena story that allows for one of the better interactions between her and Lillian. It’s great to see Lena continue to be crafty yet well intentioned and having her outwit her mother is really satisfying. 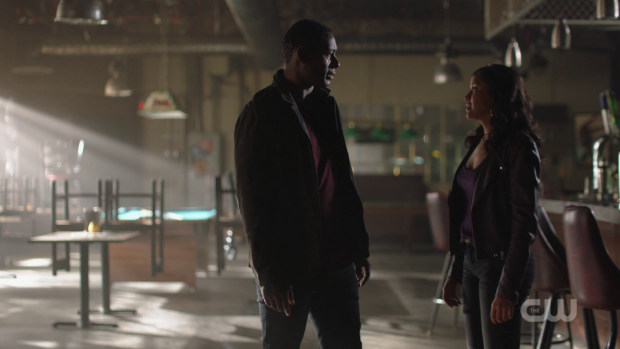 J’Onn in a more subdued role makes for a great introduction for Fiona and I like the Alex/Brainy dynamic so far even if Brainy is ultimately filling the Winn role at least for now.